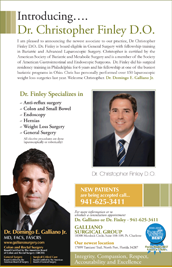 Dr. Finley is excited to bring fellowship-level bariatric and weight loss medicine to Charlotte County. Obesity is rapidly becoming more and more prevalent in our society, affecting over a third of all American adults. Humans are not well designed to carry an excessive amount of body fat which is why obesity can lead to several medical problems including diabetes, high blood pressure, sleep apnea, and increased risk for several forms of cancer. Family history and genetics play a major part in developing obesity, which can make weight loss even more difficulty. The food industry is also to blame by producing an increasing amount of highly processed, nutrient-depleted products with confusing nutritional guidelines. It's no wonder the majority of all diets fail to sustain long-term weight loss. During his medical training, Dr. Finley found the vast majority of what we do in medicine and surgery is manage the problems that arise from health problems without ever fixing the root cause of disease. This is very much like figuring out different ways of putting a bucket underneath a leaky roof rather than just patching the leak altogether. Dr. Christopher Finley, DO, specializes in the surgical subspecialties of Bariatric and Minimally Invasive Surgery. He is fellowship eligible in Minimally Invasive Surgery and Bariatric Surgery. Dr. Finley found the vast majority of what we do in medicine and surgery is manage the problems that arise from health problems without ever fixing the root cause of disease. This is very much like figuring out different ways of putting a bucket underneath a leaky roof rather than just patching the leak altogether. Bariatric surgery has been shown time and time again to be the most effective way to cure obesity and obesity-related diseases. Patients undergoing weight loss surgery not only lose the majority of their excess body weight, but also keep the weight off for good. More importantly, diabetes, high blood pressure, sleep apnea, and all other obesity-related diseases resolve or are significantly reduced. This dramatic effect of bariatric surgery inspired his passion for weight loss medicine. Training in a specialized bariatric fellowship program at one of the busiest bariatric centers in Ohio allowed Dr. Finley to perfect the surgical skills needed to perform these advanced laparoscopic surgeries while keeping the surgeries as minimally invasive as possible. He is committed to bringing Charlotte County a complete comprehensive weight loss program that will allow patients to reclaim their lives free from obesity. We are a medically supervised weight loss clinic where we offer education, appetite management and exercise activity to help you lose weight. 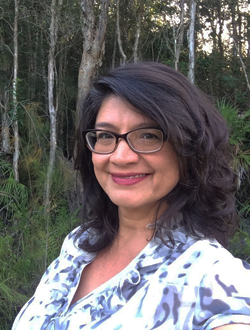 Dr. Rebeca Bright specializes in providing psychotherapeutic treatment for emotional issues associated with health related conditions. 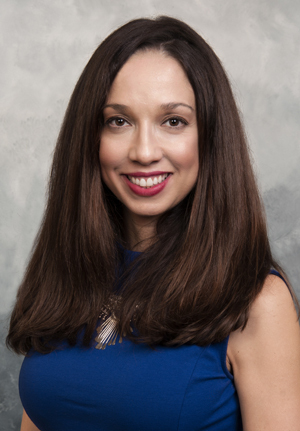 She offers bariatric surgery evaluations and IBS focused therapy. This is usually the first step in determining the best course in your treatment. If you suffer from weight related problems, contact our Bariatric Clinic to make an appointment. Kim Riley, RD, LDN, CDE. Kim Riley has earned her Bachelor's degree from Montclair State University in NJ with a focus on human nutrition and biochemistry. She is a registered dietitian, certified diabetes educator and Licensed dietitian/nutritionist in the state of Florida. She has spent the last 20 years helping clients with weight and diabetes management with an emphasis on surgical and non surgical weight loss. Ms. Riley can help you stay healthy while losing weight. Obesity is now ranked as the second-highest cause of preventable deaths in the United States. The rate at which obesity has worsened over the past 20 years is alarming, and there is now a growing amount of national attention focused on the problem. In 2012, the American Medical Association finally declared obesity to be a disease. When talking about obesity, it is very important to make the distinction between the social impact of obesity and the medical impact. There are many who feel strongly that there is nothing wrong with being obese. These individuals and groups have advocated for fair and equal treatment of those who are morbidly obese, asserting that being of larger size is something to embrace and be proud of. That is a very different issue than the reality of the impact of obesity on the human body. Put quite simply, the body was not designed to carry excessive amounts of weight. Once a person’s weight reaches the state of obesity, there is a significant amount of stress placed on the cardiac, respiratory and musculoskeletal systems. Over time, without a reduction in weight, this causes other diseases to emerge, and ultimately leads to an earlier death. A study published in 2013 in the American Journal of Public Health demonstrated that close to 20% of U.S. deaths are due to obesity, or nearly 1 in 5 adult deaths. This is a significant increase from the previous rate of only 5%, or 1 in 20 adult deaths. In order to determine the best weight loss solution, it is important to complete an obesity risk assessment. While there is no perfect method for measuring the degree of a person’s obesity, the Body Mass Index (BMI) is the most widely accepted method used today. BMI describes the relationship between a person’s height and weight. As the amount of weight for height increases, the BMI rises. As the BMI rises, the likelihood of that person developing one or more of the many obesity-related co-morbid conditions increases. And at the morbidly obese BMI levels, the severity of those diseases is significant. While studies have shown that as little as a 10% reduction of weight can improve the co-morbid conditions caused by excess weight, to achieve resolution of these conditions, significant and long-term weight loss is needed. For patients with BMIs less than 35, weight can be lost non-surgically when working closely with a physician and multidisciplinary team. For patients with BMIs 40 and greater, despite the amount of attention focused on non-surgical weight loss, there has yet to be a single, effective method identified. Studies have shown that while most people can lose weight, 90-95% regain the lost weight within 1-2 years, and often gain more. In comparison, weight loss (bariatric) surgery has consistently demonstrated that significant weight can be lost by patients with higher BMIs, and more importantly, that the weight loss can be sustained long term. Additionally, weight can be lost non-surgically by patients in the lower BMI ranges when working closely with a physician and multidisciplinary team. When the BMI falls between 35 and 40, both surgical and non-surgical weight can be considered. The physician working with the patient will look at the BMI in conjunction with other medical conditions a patient may have, and will then make a recommendation as to the best weight loss approach. Making the decision to have weight loss surgery can be overwhelming. We want to give you as many tools as we can to help you make that decision. Here are a few of the procedures that can help. Laparoscopic Roux-en-Y Gastric Bypass is a minimally invasive procedure, and is the most successful and most frequently performed weight loss procedure to manage obesity. Surgery involves creating a small stomach “pouch” with staples, and separating it from the rest of the stomach. A portion of the small intestine is then “bypassed” and re-attached to the stomach in a different way. The remainder of the stomach continues to produce digestive enzymes, which aid in digestion after they reach the food farther down in the gastrointestinal tract. As a result, you eat less food and absorb only part of the food that you do eat. This procedure creates a feeling of fullness sooner after eating and allows for absorption of only part of the food eaten. Laparoscopic Sleeve Gastrectomy is a minimally invasive procedure that involves dividing the stomach into two separate parts. The portion of the stomach through which food passes is shaped like a tube, or a sleeve. This results in the stomach no longer being able to hold a large portion of food, therefore patients eat less while still feeling full. Food digestion occurs through the normal process, so nutrients and vitamins from food can be fully absorbed into the body. Laparoscopic Revisional Surgery is available to patients who have already undergone a primary weight loss surgery procedure. These procedures are generally designed for patients who have experienced complications from their initial surgery. The adjustable gastric band controls weight loss by injecting fluid through a port which connects to a band placed around the top of the stomach. This makes the band bigger or smaller. Results from the band over the past five years have not been as favorable as those with the gastric bypass or sleeve gastrectomy. Q: How long do I have to wait until surgery? A: The average wait time from program enrollment to surgery is approximately 6 months, but can be as soon as 6 weeks in select cases. This can vary depending on your readiness for surgery, the requirements of your insurance company, and the results of the testing ordered by your surgeon. You must complete all required testing before your surgery can be scheduled. Q: How long will I be off of work? A: Most patients are off work for four weeks following a laparoscopic weight loss procedure. The actual length of time may vary depending on the type of surgery that you undergo, other medical conditions that you may have and your individual recovery. Regardless of which surgery is performed, heavy lifting is prohibited for a minimum of one month following surgery. If your job involves lifting objects that weigh more than 15 pounds, your time off work may be longer. Q: How long will I be in the hospital? A: The average hospital stay for patients undergoing laparoscopic gastric bypass surgery is two days. The average hospital stay for patients undergoing laparoscopic sleeve gastrectomy surgery is 1-2 days. Q: When will I start to see results following surgery? A: Patients will begin to lose weight immediately following surgery. Those who closely follow the recommendations of the team can expect to see significant weight loss as soon as six months after surgery. Q: What kind of support will I need at home after surgery? A: During your first week after surgery, you will need someone to assist you. All patients are required to have someone staying with them for their first week. Q: How often will I see my surgeon after surgery? A: Post-operative visits are scheduled for all patients at one week after surgery. After your initial post-op visit, you will be scheduled for appointments at the intervals that your surgeon orders. Q: Why is post-operative follow-up so important? A: Success after weight loss surgery is directly related to how closely you follow your post-operative program. This includes diet, exercise and vitamin supplementation. Because we know that there are numerous changes to make and requirements to follow, we see you frequently in our office for follow-up. History shows that patients who come in for all scheduled visits and who regularly attend monthly support group meetings have the best outcomes. Following gastric bypass surgery, patients will begin to lose weight quickly and will continue to do so during the first 12 months following surgery. Studies show that post-operative patients who choose to be compliant with post-op recommendations can expect to lose 60 to 70 percent of their excess body weight in the first 12 to 18 months following surgery. Studies also show that patients who continue to followthe program can maintain 50 to 60 percent of their weight loss for as long as 10 to 14 years following surgery. Q: How will my weight loss affect my health? A: In addition to lower BMI and other health benefits from weight loss, 96 percent of patients experience an improvement in or elimination of obesity-related health conditions such as Type 2 diabetes, high blood pressure, sleep apnea, reflux disease (GERD), etc.